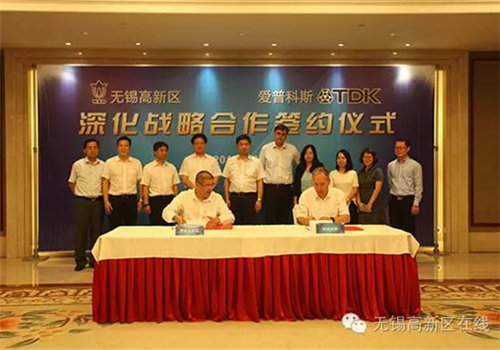 German-Japanese semiconductor manufacturer TDK EPCOS and Wuxi National Hi-tech District (WND) signed a memorandum of understanding (MOU) for further cooperation on Aug 24, Wuxi Daily reported. TDK EPCOS also announced it is to add 664.1 million yuan ($100 million) of registered capital in 2016 for production of chip-sized acoustic filters. The investment is expected to boost annual yield to 60 billion micro acoustic filters, bringing in sales revenues of 4 billion yuan by 2018. Established in 2000, Wuxi TDK EPCOS has been a major auto parts supplier and intelligent component and module manufacturer in the city. It has key contracts elite companies such as Samsung, Apple and Huawei. Wuxi mayor Wang Quan attended the signing ceremony, and met Christian Block, CTO of EPCOS AG and Corporate Officer of TDK Corporation, Japan. 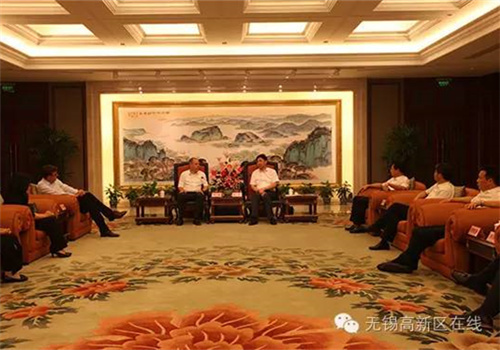 Wang congratulated Wuxi TDK EPCOS for its fast and effective development over the past 16 years, and stressed that the cooperation is important for Wuxi's industry upgrading and transformation. Wuxi will lend full support to TDK EPCOS' construction, he added. Christian showed his appreciation for the help received from the Wuxi government during the company's development. He said that Wuxi has been one of the most important global bases for the company. In the future, TDK EPCOS will transfer more resources to Wuxi for further cooperation in various fields, including mobile equipment, Internet of Things and auto application.